Libyans on Tuesday celebrated Col. Moammar Gadhafi's 40 years of rule with lavish pageantry -- complete with a lengthy parade, an elaborate stage production and spectacular fireworks. 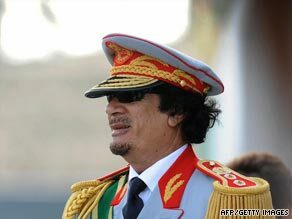 Libyan leader Moammar Gadhafi greets guests Tuesday at a military parade in Tripoli. The massive celebration for 67-year-old Gadhafi came less than two weeks after Abdelbeset Ali Mohmed al Megrahi, who was convicted of murdering 270 people by blowing up Pan Am Flight 103 over Lockerbie, Scotland, was freed from a Scottish prison on compassionate grounds. The world watched as al Megrahi, who has terminal cancer, stepped off a plane this month to a cheering, flag-waving welcome considered offensive by U.S. President Barack Obama, Britain's foreign secretary and others. Gadhafi, who took over as the leader in Libya after staging a coup in 1969, has had strained relations with the West for decades and has been blamed for organizing or financing several acts of terror. It wasn't until 2004, after nearly 25 years, that the United States fully restored diplomatic ties with Libya. On Tuesday, sitting behind a bullet-proof screen with a child on his knee, Gadhafi watched as his army marched by as part of the extensive parade commemorating his rule. The flamboyant Libyan leader was flanked by Venezuelan President Huge Chavez, Zimbabwean President Robert Mugabe and King Abdullah of Jordan, while other governments sent lower-level delegations. For more than two hours, they watched Libya's armed forces pay homage to their leader, with air force jets emitting trails of green -- the color of the Libyan flag. But it was the military hardware -- much of it freshly painted -- that drew attention: upgraded tanks, missile carriers, rocket launchers. After selling oil for nearly 50 years from the world's ninth-largest reserves, Libya has the cash for such upgrades. And though neither France nor Russia sent top diplomats to the celebrations, both countries are pitching hard for big military contracts. The parade was followed by huge theatrical rendition of Libyan history dating thousands of years -- depicted with extravagant costumes, detailed choreography, massive stage props and horsemanship. Gadhafi is scheduled to attend the upcoming U.N. General Assembly, and his taste for the eccentric angered some Americans when speculation surfaced that he would pitch his trademark Bedouin tent -- which he travels with internationally -- on the lawn of a residence owned by the Libyan government in an affluent New Jersey suburb. The U.S. State Department has since stated that Gadhafi will not be staying in Englewood when he attends the U.N. session. Yet, the notion, coupled with al Megrahi's celebratory homecoming, infuriated many of the families of the Pan Am 103 victims, some of whom live in New Jersey. Once considered a pariah nation, Libya took responsibility six years ago for the Lockerbie bombing -- even though Gadhafi later denied any culpability -- and the government was obligated to pay $2.7 billion in compensation to victims' families. Gadhafi also formally renounced the pursuit of weapons of mass destruction at the end of 2003, opening the country to nuclear inspectors after months of secret negotiations with the United States and Britain. Still, despite playing nice in recent years, Tuesday's pageantry gave Gadhafi a chance to boast as a force to be reckoned with. CNN Senior International Nic Robertson contributed to this report.